One of the first significant changes that Mr Shackleton implemented when he became acting Headteacher in January 2016, was to introduce the schools Junior Leadership Team. As a schoo,l we thought it was beneficial to move away from the generic ‘school council’ and move towards a streamlined, more focussed group of students, who can help support in all areas of school improvement. The Junior Leadership Team started with lots of positive momentum and resulted in over 60 students wanting to be part of this new venture. In the last academic year, we have again streamlined the JLT to focus on three different areas. These areas, listed below, allow the students to have their say in the future of the school. 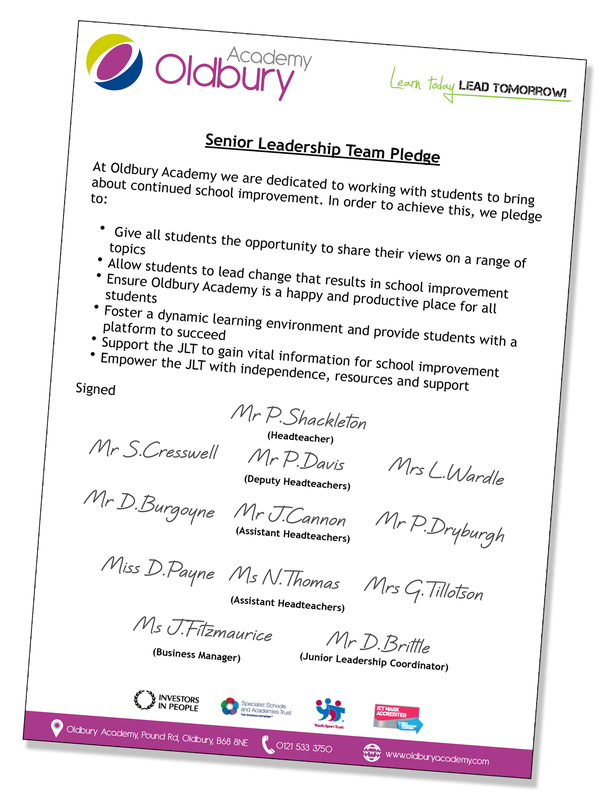 Our Senior Leadership Team created and signed a pledge to show support to the Junior Leadership Team and have created a platform for the students of our school to have a voice and to raise their concerns, ideas and to allow them the support and direction to put these ideas into practice. Allowing our students to have the confidence, opportunity and ambition to move their school forward is absolutely key to the staff and governors at Oldbury Academy. The JLT meet regularly and are able to discuss and implement the ideas and suggestions of their peers. Not only do the JLT support with whole school events like cake sales, anti-bullying weeks and student surveys, we also ensure that they are trained to deal with different situations. Over the next few weeks our Junior Leaders, along with Prefects and Sixth formers, will be Peer Mentor trained to allow them to not only listen to their peers, but also support them. We are also going to be delivering training on how to observe a lesson. We are now in a situation where students apply, and get interviewed for a place on our JLT. This encourages our students to use skills that they would need in life, at an early age. We have recently introduced a structure to our JLT to ensure that key messages, action points and plans get implemented and executed consistently and effectively. All of the students on the JLT work really hard to ensure that their school is a place where students feel happy and safe, and more importantly, feel listened to. Our JLT members are brilliant at delivering key messages in assemblies and producing materials for form tutors to share with their students during form time. Enclosed in this pack, are a few examples of the assemblies, and presentations that our JLT have delivered to not only the students of our school but also to staff, parents and governors. Oldbury Academy is dedicated to listening to their students, and we want to create a team of students who will be sustainable and provide a different perspective on the decisions that we make for the benefit of our students.